Who Doesn’t Love a Good Anecdote About Ka-Bar Knives? This is one knife you cannot ignore. It’s black, it’s beautiful, and it’s partially serrated. It is one of Ka-Bar’s best-selling utility knives, and it isn’t showing any signs of slowing down. This model may not be their biggest, measuring in at 11.75 inches, but the thing is pretty darn useful. The blade is made of 1095 Cro-van steel, it is 7 inches long, and it is at a fixed position. The knife handle materials are made of Kraton G, which is a synthetic rubber substitute. It’s tough, durable, and is very low maintenance. Unlike leather, it will be less susceptible to natural wear and the elements. As knife grinds go, one of the cool things about this particular model having a flat grind means that there is less drag when you are using it. 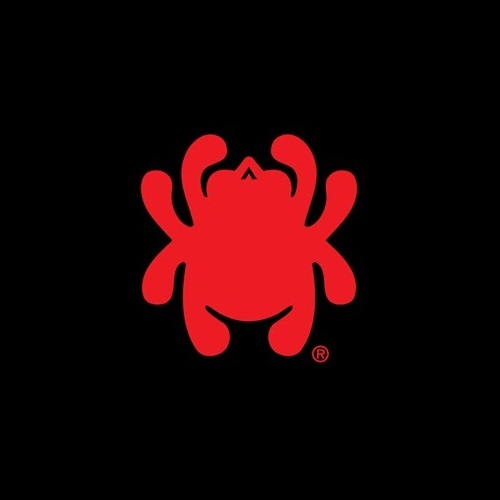 It is precise and deadly in its efficiency. 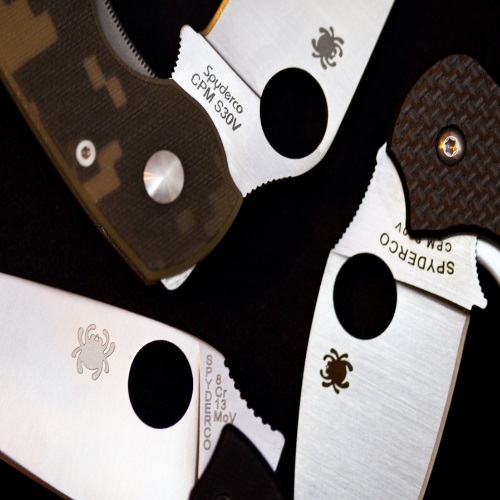 The blade’s thickness is 0.165 inches, and the knife weighs 0.70 lb. This is yet another model which is very popular with various branches of government, law enforcement, and military. The steel is easy to handle and sharpen, and the handle fits in your hand like a boss. There is no doubt in my mind that even though historically, leather has been used for much longer – some of these synthetic alternatives are giving leather a run for its money. Pretty much anyone who owns a Ka-Bar knife is also the proud owner of at least one Ka-Bar story. It could be about anything, from a military/law-enforcement anecdote to cutting down coconuts right off the tree while on vacation in rural Jamaica. I have one such story regarding this particular knife. Now, I don’t personally own this model, but I did get a chance to see it in action, up close and personal. This is the story of how that came about. When I was about to be a high school senior, I went on a three-day deer hunting trip with my father, my uncle, and my two cousins. It was summer, and I was looking forward to this trip a great deal. My uncle didn’t come around to our neck of the woods too often, so it was cause for celebration. Instead of just going out to dinner somewhere, as usual, my father – in his infinite wisdom – suggested we plan ahead this time, take a camping trip, and really make some memories. We did just that. And it was awesome. One such memory is that of my uncle dressing a small deer with his black Ka-Bar. Many would agree that this isn’t the ideal knife for dressing game, but it was still one of the fastest operations I had ever seen. My uncle shot it with some type of AR-15 rifle (the precise make and model elude me), and went to work quickly. He pulled out his Ka-Bar, and in no time that deer was good to go. What is great about this knife is that it is a combo knife. The plain edge and serrated edge were both used in the process, and I got to see just how useful a combination edge can be. I remember sitting next to the campfire, watching my uncle get down and dirty with that deer. I was enthralled. Granted, I didn’t have that much camping experience, so I had no solid frame of reference – but it was pretty amazing watching my uncle rack him, gut him from the bottom up, remove the organs, skin it, and prepare it for transport. His Ford was more than up to the task, and it was one camping trip which I never forgot. I had seen my uncle’s knife before, of course, but I don’t think I ever saw him use it up until that point. Definitely not like that. It changed the way I looked at knives, I guess. Firearms have their place, of course, especially when it comes to hunting. But, there is something about a knife that is a lot more primitive, and I mean that in the best possible way. If you are at all into survival, hunting, camping, or anything related to primitive skills – this is one knife that you will want to check out. Like I said, I don’t own this particular model, but it is definitely one which is on my make-believe wish list. The black serrated edge is a tool which, in my own opinion, represents many of the qualities which have made Ka-Bar so famous for a century: fine American craftsmanship, superb materials, innovative designs, and an overall legacy of excellence. There are many knives on the market, and some of them are really excellent (Spyderco, TOPS, Cold Steel, and Victorinox come to mind), but for me Ka-Bar has that extra something. Perhaps it is the fact that this knife was issued to U.S. troops in WWII, Korea, and ‘Nam. 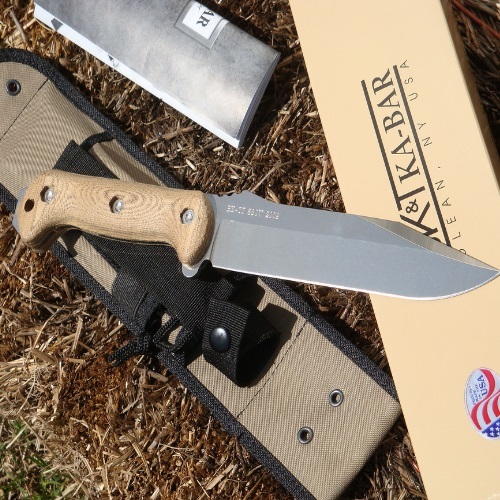 To this day, the words “ka bar” are synonymous with a top-quality combat knife. The military wouldn’t just accept any design. 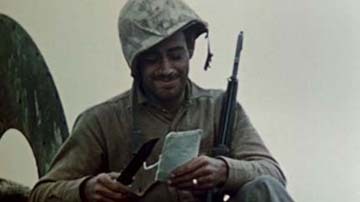 It had to be a great knife for the Marines to consider adding it to their standard equipment. These are knives which have linked and transcended generations. Some of them have literally been passed on from one family member to the other, ever since the Second World War. 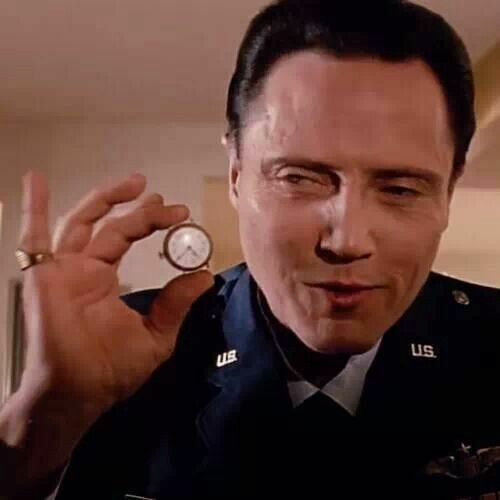 It reminds me of Christopher Walken’s “Gold Watch” monologue in Quentin Tarantino’s Pulp Fiction. You could argue that there are better Ka-Bar models out there, like the special Becker designs, the iconic USMC knife, or the D2 Extreme Fighting. What can I say? To each his own. I have seen the Ka-Bar black serrated edge knife in action, and it was such a powerful and memorable image, that I just had to tell the story. Could a different Ka-Bar model, or another knife entirely, have achieved such results with that deer? Yes. Without a doubt, yes. 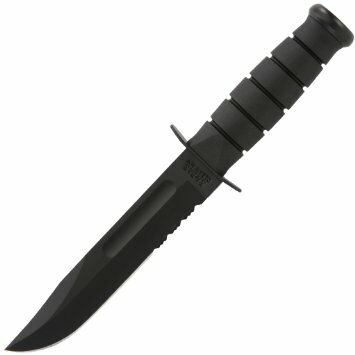 But still, there is something about Ka-Bar which just calls out to me. To be honest, I don’t go camping nearly as much as I would like these days, but when I do get the chance to take a break and get the hell out of the city, I take a Ka-Bar with me. You never know when you’re gonna need it.